"Innovative Ideas . . . Specially designed to contain fruit juice and berries, this stainless steel conveyor uses cleated belting to gently move material from one process to another in the winery. 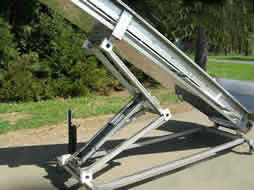 The elevating conveyor belt is made with food grade PVC belting and features 2" high "u" shaped cleats on 12" centers. 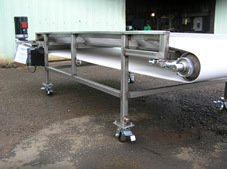 The conveyor is equipped with a full length drip pan located below the belt and a 1 1/2" stainless tri-clover to drain liquid. 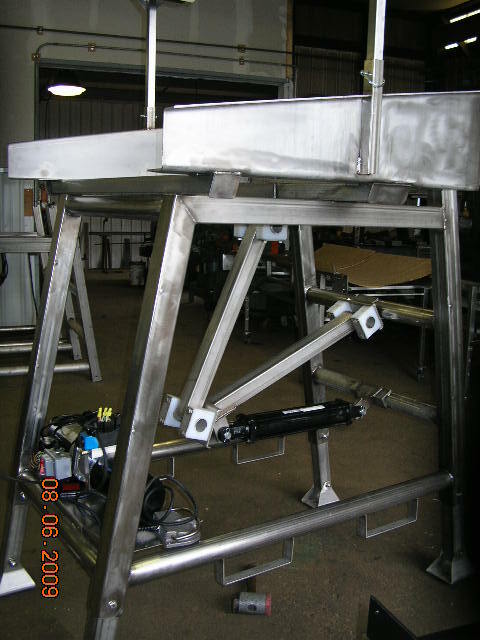 An adjustable hydraulic jack to lifts the conveyor to any position between 6 and 12 feet, and utilizes a safety stop lock to prevent slippage. It also features an unique system to track the belt. Sturdy, locking 6" caster wheels provide easy movement of the machine, an additional features of the conveyor is the large size lower hopper and the low profile. A definite plus when handling tons of materials. The ease of height adjustment, dumping fruit, movement around the plant and clean-up found in this machine will give you an easy harvest! Overall Lift: 4 - 12 ft.
To move grapes from field bins to the winery for sorting and fermentation, DPI offers a shaker conveyor, made of stainless steel with a mild steel frame. The large size of the hopper (72" square) will accept 48" totes full of freshly-picked grapes. DPI's shaker conveyor can be ordered with a MOG (materials other the grapes) screen built into the pan to filter out juices and other debris. Models equipped with MOG (materials other the grapesscreen come with a removable drip pan with 1.5" stainless tri-clover installed. 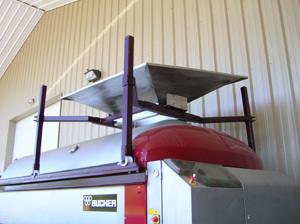 The shaker conveyor pan gently oscillates to spread the grape clusters evenly as they come out of the field totes. Power is provided by a 115/230-volt unit equipped with variable speed drive. DPI's capping conveyer enhances the efficiency of your bottling line and saves manual labor by providing a steady supply of screw caps or corks for your line of freshly bottled wine. 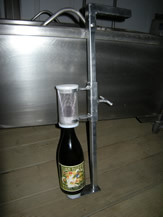 The DPI capping conveyor eliminates stationing an employee at the top of a ladder to pour buckets of caps into the bottling machine to seal your wine bottles. 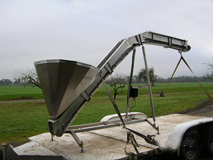 The machine provides an adjustable height conveyor raising the product to 12 feet, with a low infeed hopper and gentle feed. Adjustable leveling feet allow placement of the machine on uneven floor surfaces. DPI's capping conveyor is electric, powered by a 115/230-volt motor with variable speed drive, and a quiet sanitary plastic feed chain. Moving freshly harvested grapes from vine to processing area with efficiency and skill demands the right tool for the job. DPI winery equipment does just that by providing vintners with an easy, cost-effective method to place your field-harvested grapes onto your sorting table, destemmer or crusher. DPI bin dumpers are designed to provide reliable service with machinery that is durable and easy to clean. This dumper features food-grade components, including rustproof bearings and pivot points. Electric-over-hydraulic power provides simple, positive dump control. Dump height is adjustable, as is the hold-down bar. Bin dumpers are available either in all stainless steel models or those with powder-coated mild steel frames. DPI's bin dumper bin with retainer bar rotates to maximum 135 degree angle, enabling complete clean-out of the tote. Stability of the machine is enhanced by swivel footpads located at the base of the machine to accommodate minor unevenness in flooring surfaces in the processing area. Forklift sockets provide easy moving of the machine around your facility. 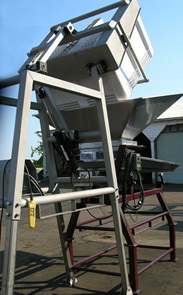 Though designed to accept 48" bins, the bin dumper requires only a 6-foot square footprint in the grape processing area. Lift sockets provided with the machine allow operators to place it precisely where they need it, yet easily move it to a different area when the occasion dictates. For vintners needing to move their destemmers up in the air to slide a grape tote underneath DPI offers a variety of destemmer stands, custom made to fit individual winery need. If you want to destem directly into a fermentation tank, DPI has a simple solution. Install your destemmer on a DPI rolling stand and your problem is solved. DPI rolling destemmer stands feature adjustable height, large heavy-duty locking caster wheels and a choice of all stainless or powder-coated mild steel and stainless framed materials. You let us know where the destemmer fits most easily into your line of harvest equipment, how high it needs to be, and what you wish to place under or over it. We'll build a sturdy, easy to clean and maintain stand to fit your requirements. DPI sorting tables provide a versatile, study accessory in grape processing. Use a DPI shaker conveyor in front of the sorting table to gentle meter the grapes onto this 30" wide surface for sorting. Sorting tables are built with adjustable legs to reduce worker stress of sorting fruit for destemming and crushing. Each sorting table uses an electric motor with inverter to quietly and efficiently move its product to the next step. 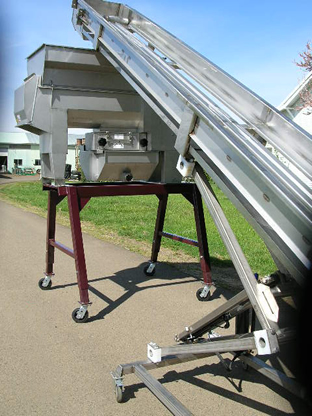 The sorting conveyor is fabricated of stainless steel and features a unique, open-sided construction for easy cleaning and maintenance. Table height: Adjustable, 24" - 36"
Tools for harvest needs to be sturdy, easy to clean and built for long-term use. DPI offers a line of harvest tools built to the exacting standards that grape growers require as they process their fruits into finely crafted wines. The DPI pump down torpedo is built of perforated stainless steel with an easy-to-grip handle for penetrations into the cap. It features a 1" suction tube running down through the center of the tool and is fitted with a 1.5" stainless tri-clover at the top. The punch-down tool also allows fro efficient penetration of the cap of grape skins and other debris in the fermenting tanks. Its bottom screen pivots, providing processors with added versatility. Dimensions: Handle 5ft long, screen 8" x 12"
DPI pump over bins developed by the company easily trap skins and other debris generated during the harvest and fermentation process. Pouring the juice and cap through the removable perforated stainless steel screen basket easily separates the juice from debris. Conveniently placed lifting handles assure ease in handling and cleaning after removal from the juice. Heavy duty caster wheels provide for ease of movement wherever it is needed in the winery. This versatile unit has a low profile, making it easy to get under tank openings, or the doors in the winery. Sampling wine as it ages in tanks is easily accomplished by using the DPI tank sampler. Built of stainless steel to insert into the fermentation tank, the bottle sampler feature a 5 ft. handle to break through the cap and a screened bottle intake mechanism to easily fill the sample bottle.